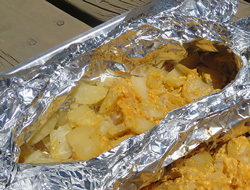 Potatoes in foil cooked on the grill. You will first need 6 foil sheets approximately 10 inches long. Spray each sheet of foil with cooking spray. On each sheet put approximately 1 cup potatoes. Sprinkle potatoes with parsley, garlic powder, chopped onions, salt and pepper. 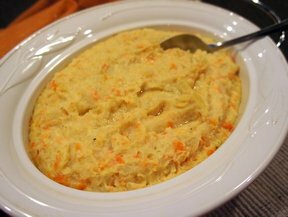 Top with pats of butter. 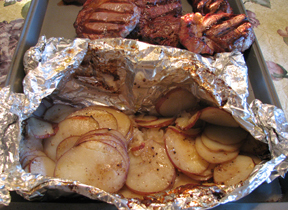 Fold over ends of foil and seal; place on indirect heat on grill. 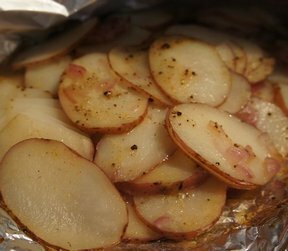 Potatoes should take approximately 40 minutes on a grill at 350 degrees. "My favorite! My grill was acting up so I had to bake these. They were still delicious!"